After her Pro Wrestling Eve championship defense against Sammii Jayne at XWA 46 on March 12, Rhia o’Reilly suffered an injured leg and ankle. Although she has yet to relinquish the title, Pro Wrestling Eve was forced to declare a new champion, in the form of a tournament! And at today’s ‘Babes with the Power’ event, the preliminary rounds took place. During the Leah Owens vs Kasey Owens match, Nina and Shanna interfered, causing a disqualification. This then lead to a brawl that went outside the ring between the group. Dan Read, PWE’s promoter, then announced that at tomorrow’s show we shall see the Owens Twins take on Nina and Shanna in a tag team match. 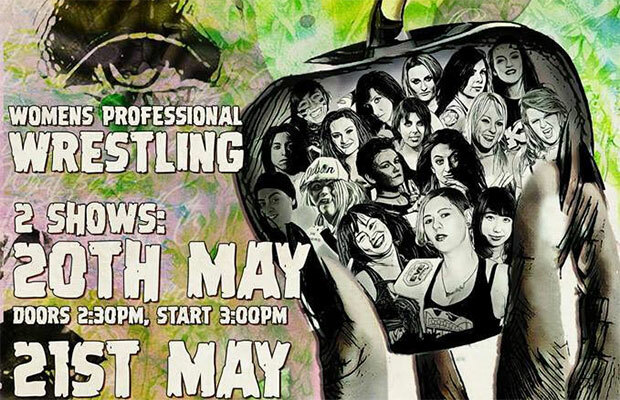 Tomorrow’s semi finals will be followed by the final round, in which the new Pro Wrestling Eve Women’s champion will be crowned. This will then end O’Reilly’s title reign at 425 days, after winning it on March 20th, 2016, against Nikki Storm. Tickets for tomorrow night can be bought at the Resistance Gallery, London at 3pm! What do you think of these results? Who do you want to see walk out tomorrow as champion? Let us know your views in the comments below!